The Teeter Hang Ups EP-960 Inversion Table is part of the New Teeter EP 60-Series that are designed to enrich your experience while achieving the maximum in back and joint pain relief through inverting with precision balancing. The table includes Teeter’s patented stretch grips and the innovative ComforTrak bed design accommodates the pressure point and decompression accessories. The Teeter Hang Ups EP-960 Inversion Table allows you to take inversion to the next level, in just a few minutes a day you will achieve a natural stretch that will increase flexibility, build strength and help improve the health of your spine and joints, through inverted exercises. What Makes The Teeter Hang Ups EP-960 Inversion Table Different: The Teeter Hang Ups EP-960 Inversion Table is specifically designed for those who have back pain to the point where they have trouble reaching their ankles. Unlike the other Teeter Hang Ups tables, the The Teeter Hang Ups EP-960 Inversion Table has a ratcheting handle so you only have to reach to knee level to securely fasten your feet. The Teeter Hang Ups EP-960 Inversion Table - Enhances the user experience to achieve the ultimate in joint and back pain relief through precision balancing, patented stretch grips and an innovative bed design that accommodates pressure point and decompression accessories. Take inversion to the next level with best-rated and most customizable inversion table on the market, the Teeter Hang Ups EP-960 Inversion Table. In just a few minutes a day, achieve a natural stretch to help improve the health of your spine and joints, increase flexibility, and build strength with inverted exercises. For over 30 years, people have been using Teeter Hang Ups to help relieve their back pain and improve their lives. Medical and scientific studies from around the world have shown the benefits of inversion and Teeter is proud to lead the way as the only brand to meet UL’s standard for safety. Independent quality assurance gives Teeter users piece-of-mind to relax and enjoy the deep stretch that can naturally relieve back pain. Target back pain at the source with a fourpronged approach that helps to rehydrate discs, realign the spine, reduce nerve pressure and relax muscles. 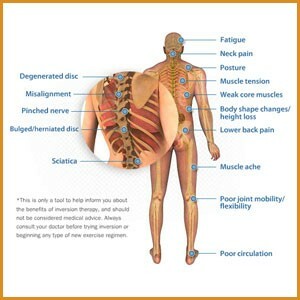 Inversion therapy also helps with joint health and flexibility to relieve joint pain in the neck, upper, mid, and lower back. A preliminary study out of Newcastle University reported a 70.5% reduction in the need for sciatica surgery for patients who regularly used a Teeter Hang Ups inversion table as opposed to physiotherapy alone. Why take a chance on a lookalike that doesn’t even come close to meeting basic safety standards? Trust only Teeter Hang Ups for a better back, better body. Call 1-800-875-9145 to talk with one of our fitness advisors with any questions you may have about the Teeter Hang Ups EP-960 Inversion Table. 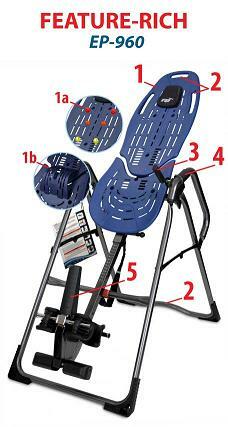 Order your Teeter Hang Ups EP-960 Inversion Table from FitnessZone.com today! Bonus Healthy Back DVD Content: FIVE 10-15 minute Healthy Back exercise and stretching classes by Dr. Shawn, including Good Morning (wake up and warm up your spine), Strength & Stretch (build your core muscles), Posture Correction (look better and function better), Gym Ball (a specialized core building class), and Inversion Table (to receive the maximum benefits from your Teeter Hang Ups Ep-960 Inversion Table). Comfort Trak Bed: Built for the benefits with a pressure-reducing design that maximizes comfort and flexes with the user to enhance joint mobilization. The Teeter EP-960 Inversion Inversion Table has an innovative track design accommodates the optional Adjustable Acupressure Nodes and Lumbar Bridge accessories. Optimum Decompression Surface: The smooth surface reduces friction, allowing the body to slide and achieve the optimum decompressive stretch on the Teeter EP-960 Inversion table. No Tear, No Stain Construction: The Comfort Trak Bed is more durable than typical nylon or vinyl beds vulnerable to wear and tear. The Teeter EP-960 Inversion Table has an easy-to-clean surface that ensures pristine appearance over years of use. Adjustable Head Pillow: Soft foam pillow can be moved or removed for your comfort needs on the Teeter Hang Ups EP-960 Inversion Table. Grip-and-Stretch Grips: The Comfort Trak bed and A-frame both feature built-in inversion grips for added stretching and decompression. 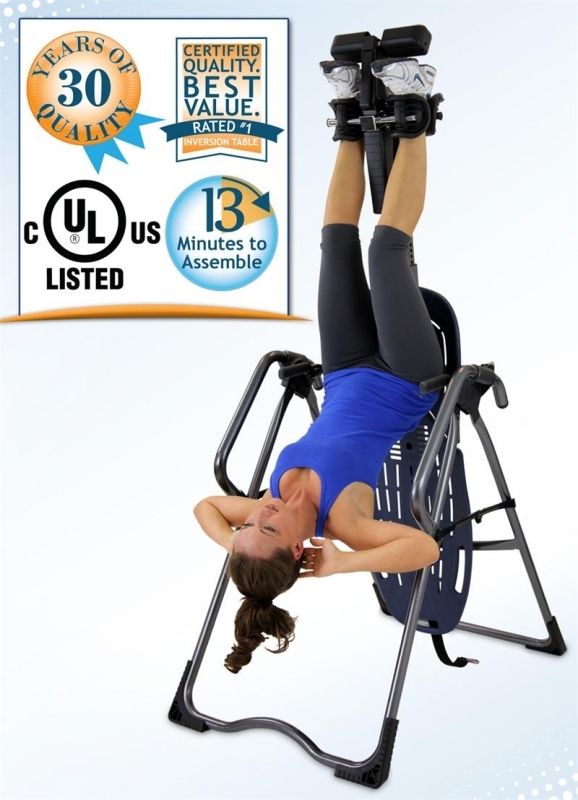 This is a great added option on the Teeter Hang Ups EP-960 Inversion Table. 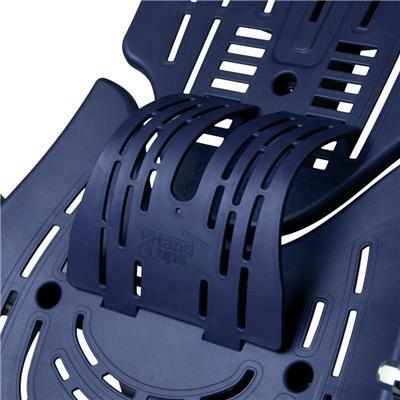 Ergo-Embrace Supports: Pressure-reducing specialty foam cups surround the ankles, distributing body weight comfortably around the foot and heel on the Teeter Hang Ups EP-960 Inversion Table. 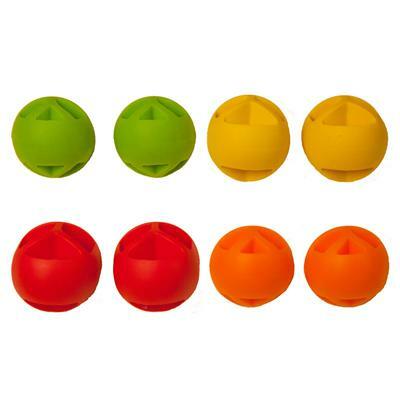 This design greatly reduces ankle discomfort to allow for a relaxing and secure user experience. Ankle Comfort Dial: The foot platform design dials up or down for smaller or larger feet, allowing a comfortable and secure fit for the ankle clamps on the Teeter Hang Ups EP-960 Inversion Table. Pre-set Rotation Control: The adjustable or removable tether strap allows you to easily pre-determine your maximum angle of inversion on the Teeter Hang Ups EP-960 Inversion Table. Stable Base (and added floor protection): Corner feet increase the A-frame base by 20%, and reduce sliding on hard surfaces. The Teeter Hang Ups EP-960 Inversion Table has a heavy-duty steel frame base which features raised grips for enhanced stretching and decompression. Smooth, Quiet Rotation: A de-rattler knob and specialized pivot bearings ensure a lifetime of squeak and rattle-free rotation on the teeter hang ups ep-960 Inversion inversion table. Easy Assembly: Arrives 85% pre-assembled with less than the average number of parts of other inversion tables; includes tools for assembly. Quick Storage: The Teeter Hang Ups EP-960 Inversion Table folds in just a few seconds to 20 x 28.75 x 66 inches (50.8 x 73 x 167.6 cm). Value Added: The Teeter Hang Ups EP-960 Inversion Table comes with a laminated Owner's Manual attached to the frame for quick-reference and an Instructional DVD to guide you through assembly and use. EZ-ReachTM Ankle System: The extended handle for the ankle lock system provides an easy-to-reach solution in addition to its triple lock security feature. EZ-StretchTM Traction Handles: Provide added benefit for inverted stretching and decompression, as well as an effective tool for oscillation. 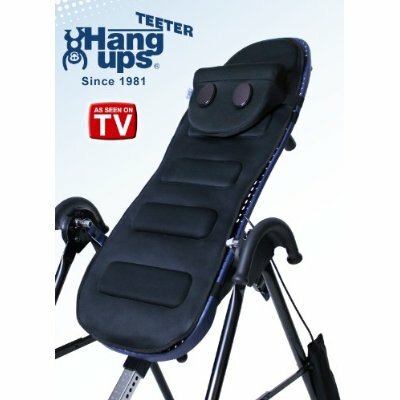 Order your Teeter Hang Ups EP-960 Inversion Table from FitnessZone.com today!